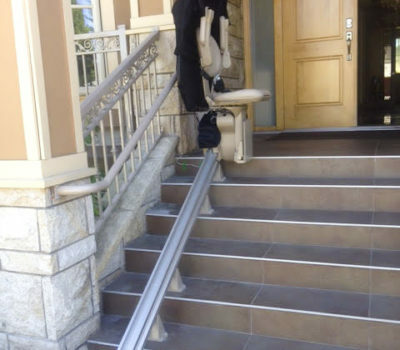 A seamless example of an HME Vancouver Outdoor Stairlift Installation. The brand of stairlift was the Bruno Outdoor Elite Outdoor Stairlift which we installed in Vancouver on stone tile. Our technicians work carefully to preserve the integrity of your flooring, no matter the type. As you can see from the images below, there’s no need to worry about a straight outdoor stairlift spoiling the curb appeal of your home. This straight outdoor stairlift blended beautifully into their cascading stair case and provided that extra measure of safety for the homeowner who otherwise wouldn’t have been able to enjoy their back yard.